As a result of ARCCA’s extensive crash safety and injury analysis experience, TV’s Inside Edition recently asked our engineer experts to demonstrate the hazards associated with a phenomenon known as “Car Surfing”. 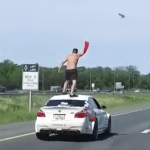 Car Surfing involves an individual climbing on top of a vehicle and, while in motion, standing on the roof unrestrained as the vehicle is driven on a roadway. Needless to say, this is an extremely dangerous behavior and has resulted in severe injuries and deaths. For the show’s segment on car surfing, Crashworthiness Expert, Michael Markushewski, arranged a series of demonstrations to show the consequences of this reckless behavior during dynamic test conditions. A test dummy was positioned in various locations on a typical vehicle and driven on a test track. When the brakes were applied even at 25 mph, the inertial force from braking caused the test dummy to slide off the roof, hood or trunk and onto the pavement. The same result occurred when the vehicle made a turn to the right or left. To view the Inside Edition segment, click here. To learn more about Mike Markushewski or to contact him, click here. MICHAEL MARKUSHEWSKI is a Crashworthiness expert, Chief Technical Officer, Vice President and Principal at ARCCA. In addition to being Director of the Failure Analysis group, his areas of expertise include occupant crash protection, restraint system design and injury tolerance.